Come sit on a white wrought iron chair by a matching small round table--perfect for laying out Tarot cards, Runes, or casting the Ogham. The table and chair are in a niche amid the herbs associated with Divination, shaded by a rowan tree and an elder tree. Here in a portion of the garden and in large pots grow basil, bay, cinquefoil, clover, damiana [carnation], dittany of Crete, hops, lavender, marigold, mugwort, mullein, thyme, vervain, woodruff, wormwood, and yarrow. Climbing the trellis is honeysuckle, whose flowers may be used to enhance divination or cleanse and prepare divination tools, as can the berries from the rowan tree and gratings from orange peels, while the dried elder flowers make a flavorful cleansing tonic when added to a black tea. Now let us look at some familiar methods of divination. One of my favorite divination tools is the Tarot -- but as anyone who has a Tarot deck knows, it doesn’t take long before one deck multiplies into many. There are so many varieties of cards, many quite beautiful to look at, that the average reader begins to accumulate more and more. I now have over 60 decks, but a friend of mine has over 100! At the present, although my book Tarot for the Green Witch teaches how to read the cards from the perspective of Witchcraft [rather than Ceremonial Magic or Kabbalah], I now have my own deck -- TAROT FOR THE GREEN WITCH -- published by Llewellyn Worldwide, and I could not be more delighted with how it turned out. This is naturally my major deck for readings! Some of the other Tarot decks I enjoy are the Cat People, Dragon, Fey, Halloween, Herbal, Hansen-Roberts, Medieval Scapini, Nigel Jackson (now out of print and becoming more valuable), Norse, Old Path, Robin Wood, Secrets, Whimsical, Ellen Canon Reed’s Witches’ Tarot (also out of print and quite valuable) decks. Different decks appeal to me at different times of the year or for readings with certain people, especially family members. Other decks don’t get used as much, but seem quite cooperative when brought out of their bags and boxes for a reading. I cleanse my decks by passing them through the symbols of the Elementals: sprinkle with salt, wave through incense smoke, pass quickly through candle flame, and sprinkle lightly with water (and wipe off! ), then I set the deck on the pentacle and wipe it dry. 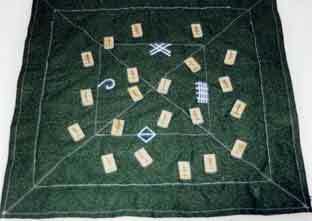 Most of my Tarot decks are kept in drawstring bags of cotton, silk, or velvet, some of which I have made and others of which I have bought. A few of the decks are simply wrapped in cotton or silk. The colors vary according to the impression I receive from the deck -- black for warding negativity, purple for enhancing spirituality, green for Nature, herbs and plant life, and brown for the Earth and animal life. You should choose whatever color corresponds with your focus and that of the deck. Nearly all of my Tarot decks are then stored in decorative tarot boxes. I have collected quite a few of the colorful boxes made in Poland from linden wood -- they have such a wonderful scent -- but I also use other styles of boxes and decorative tins. I like to keep a couple of stones, mainly covellite (for psychic openings) and prehnite (for unconditional love), with the deck I use for readings, and even with some of the decks in their boxes or pouches -- usually rose quartz or clear quartz. One of the easiest divination tools to use is the pendulum -- it is quick, effortless, and readily answers "yes/no" type of questions. Generally, you should ask a couple of test questions to which you know the answer so you can see how the pendulum designates yes and no. Ask something like, "Did I drink coffee this morning?" or "Have I fed the cat this morning?" and see how the pendulum responds. For some people yes is a circular motion and no is a linear one, but this is the opposite for others. There are some for whom the pendulum circles clockwise for yes or no and counterclockwise for yes or no. You will need to see how it works for you, which is why you initially ask a yes and a no question that you already know the answer to so you can see how the pendulum responds. The pendulum can be anything dangling from a cord. While you can suspend the pendulum in the air between your thumb and forefinger, it is easier and much more comfortable to hold it with your elbow set on a flat surface and arm bent so the cord dangles. You don’t want to impede the movement of the pendulum, so hold it out away from your arm when you ask your questions. For quick matters, you use one hand to suspend the pendulum over the open palm of the other hand. Or if you are using it for choices, hold it so that it swings freely to point to the chosen object. When trying to decide between objects -- like which stone, crystal, or piece of jewelry you should purchase [or wear today] -- you can ask the pendulum to point to the object that will work best with your energy, enhance your aura, etc. It will swing to point out the best object for you. You can take pendulum work to the very basics -- even picking out something to eat from a menu when you can’t make up your mind! But the pendulum can also be used as a spirit board. You have to be patient and go slowly, however -- not quite the same as using a planchette. In this type of work, have the letters large enough so as to avoid confusion, and a series of numbers, 1-9 or 1-10. Tell the pendulum to spell out answers, and point to a number after each letter, or to spell out answers with the letters in proper order. Some pendulums work well with using the proper order, others prefer to give you a letter and then tell you what number it is in the word. I once asked for the feline name of my sleeping MomCat, and when the name was spelled out, I tried pronouncing it. The second attempt snapped MomCat out of her nap to an alert upright pose and the expression on her face clearly said, "How in the world did you know to call me that!" I think she chastised the pendulum, but the crystal didn’t seem to mind. Which takes us to what kind of pendulums work best. I like to work with different types of crystals and stones -- amethyst, citrine, clear quartz, bloodstone, and jade, but also emerald and iolite (which is a stone specifically attuned with psychic opening) -- and each one has a unique personality, its own spirit entity as it were. When you go to buy a crystal, try out several and see which one seems eager to work with you. Some people walk up to a rack of pendulums and they all start swinging as though saying, "Ooooh, take ME!" so sometimes it is a little harder to select one pendulum out of a number of them than you might think. If necessary, stand away from the pendulums, ground and center, then approach again with a serious demeanor and see which ones still respond. You could also ask them to decide among themselves which one is best for you. Preparation before divination brings the best results. Take a couple of deep cleansing breaths, then ground and center -- shed the nervous, static energies around yourself by letting them drop into the ground to be redirected by the Earth as She sees fit; find your quiet center and envision a deep tap root extending from the bottoms of your feet into the Earth where you draw in powerful energy much as a tree draws in water. Bring that energy up through your feet, up your legs and body, into your neck and head, and then receive the universal white light through the top of your head and bring it back down through your body to balance your energies and aura with both universal and earth energy. I like to envision this process like entwining vines of energy, balancing my bodily energy points [or chakras]. Now you are ready to begin divination. This process does not have to be long or even noticeable--and you can do this whenever you feel you are getting too tense or feeling weak from over extending your own energies. Always ground and center before doing ritual or spell work, and continue to replenish your energy supply as needed through that tap root in your feet. When doing any type of divination, the important thing is to not try too hard. People are conditioned to expect things to manifest like in the movies, but really psychic matters are bit more subtle. The trick is to recognize the images you are seeing and understanding the symbology as it relates to you. This is particularly true with clairvoyance and reading auras. When using the Tarot, some portion of a card will usually grab your attention, and you need to trust this insight. In one reading I recently did, my eyes were drawn to the faint image of a swan in the background border of a card. Immediately the associations that came into my mind were "Swan Lake", Tschaikovsky, Russia, Father, and returning to the Motherland. As far-fetched as that may seem, I went ahead and said this to the woman I was reading for and it turned out that she had danced in the ballet Swan Lake (by Tchaikovsky), her father was Russian, and she was thinking about visiting Russia in the coming year. Images may also float across the pictures in the cards, or the picture may change. When I am doing a reading and the person asks a related question, the pictures on the cards appear to me to shift and address the question even before I lay out more cards. Adding a "modifier" card can generally clarify or reinforce the shift I have just seen. Scrying with a black mirror, crystal ball, or shiny obsidian gets the best results from a relaxed approach. Then you are likely to see events unfolding before you rather like watching a silent film. If you are seeking to hear sounds, words, answers, this may also happen, just as people have heard their name called when no one is around or have been wakened from a sleep by a loud voice calling them. I have done Tarot readings where I have heard the answer to a specific question rather than read it in the cards, and while this is not the norm for me, I go with what Spirit is telling me. Important reading tip -- go with your first intuitive impulse and don’t try to reason it out in your own mind or draw personal connections with your own experiences to explain a psychic moment. There are many other divination techniques, such as tea leaf reading, runes, and ogham casting, but the key again is to trust your intuition and your connection with the Power -- for whether you call this Spirits, Energies, Elementals, or Goddess and God, the Power will answer you. You can scry just about anything -- even your cereal bowl. If the Divine have something to tell you, They will use whatever means is available. I have read images while stirring the milk in my coffee, and then encountered the references during my day. It is like "touching base" with the Divine and hearing Them say, "Yes, we are here." Divination is a warm and cozy conversation. The good thing is that when you see something that disturbs you, the knowledge of it will help you to make different choices to change the way the energies are aligned, or to be so prepared for the difficulty that it passes with much less impact than it otherwise would have. Remember that divination can show you how the energies are aligned, and you can move energy, augment it, ward against it, and so on as desired.